© 2007 Glen Reynolds All rights reserved. Drink from dipping flower fountains 'til they're dry. Little barons of the golden trade they ply. Abroad the meadow 'neath the blessing sky. In the lee of the lea,Old word for hay meadow; the line popped into my head and the poem began after some gestation time. I could not get it to flow in sonnet or ordinary quatrain (4 line) form, so I just decided to go with the rhythm and it just came. The brazen bumblebeesBumblebees are quite fearless. Drink from dipping flower fountains 'til they're dry.An image of the flowers dipping down under the weight of the bees; a tongue twister to boot. 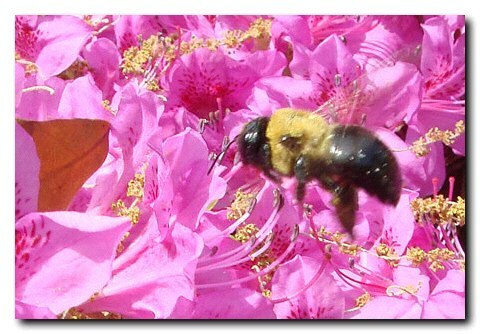 In the dappled shadow shade Tiny bombers bold arrayedThe scientific name of bumblebee just happens to be "bombus." Especially clover. They are the best pollinators of red clover because of the length of their tongues. Abrupt shift to another simile. Tiny barons of the golden trade they ply. And another simile, comparing the bees to rich "barons" of industry with their gold (pollen). A carefully chosen adjective. The sky is the heavens; Heaven blesses all nature. Heaven smiles down upon the busy bees and all of creation. Lovely! Especially the rhythm of your three-line stanza -- I'm glad you fell into that, it's better than a sonnet or quatrain would have been. Perfect for the subject and mood, and beautifully matched to the AAB CCB DDB EEB rhyme scheme (I hope I got that right). So many inspired, melodious word choices here! A sense of playful love of language. And though the notes weren't at all necessary for a relishing of this poem, they add an interesting extra layer, as with "bombus." This is the kind of poem that doesn't have to hint at deep meaning. It is what it is -- just like a summer day. A delightful thing in itself. Really nice Jeffery! Interesting that this poem was inspired by Richard Cohen's openning line "to the aged pope." It's inspired me to think of a painting! I won't add to Richard's right on observations. For me it is the vivid imagery and color. I can "feel" the temperature of yellow. A pungent synesthesia of sound and color. Real nice!